24.04.2018: The first race of Blancpain GT Series Endurance Cup 2018, unfortunately, ended before even starting for Raffaele Giammaria, who had been on track in Monza in the weekend just ended. The first race of Blancpain GT Series Endurance Cup 2018, unfortunately, ended before even starting for Raffaele Giammaria, who had been on track in Monza in the weekend just ended. The Lamborghini factory driver and Grasser Racing Team colour bearer on the #19 Lamborghini Huracán GT3 with co-equipers Ezequiel Perez Companc (ARG) and Marco Mapelli (ITA) was very motivated to start season 2018 on the right foot, in one of the most competitive editions of the prestigious series for Grand Touring cars that this year has 53 cars at the start. The round on the Italian track has definitely been very challenging for Giammaria, who struggled to find the right feeling with the car due to an irregular power distribution that limited the top speed of his Lamborghini Huracán GT3 since free practice on Friday. On a circuit like Monza, where average speeds are very high, this affected quite badly the overall performance of the car. Things did not go any better in qualifying either and Giammaria run Q2 but could not improve on the initial lap time of 1:49.824s due to a red flag following the incident of the #49 Mercedes AMG GT3. The new regulations define the qualifying time of each lineup as the average of the performance put in by each driver and Giammaria qualified therefore in 37th position. The race strategy was forced by the need of making up for the lost ground and Giammaria should have driven in the third end closing stint, but a contact between Perez Companc and teammate Rolf Ineichen, on the #82 Lamborghini Huracán GT3 after only 30 laps, forced the #19 car to a long stop into the pits first and finally to an early retirement. “I am obviously disappointed on the end result of the race in Monza. It has not been the outcome I would have wanted. After discovering the engine issues, I knew it would have been difficult to be competitive in the race, but clocking up some mileage was important to get some confidence with the 2018 tyres and with the whole setup of the car, but the race ended too soon for us, unfortunately. I will try and focus straight away on the round of Silverstone to bounce back from this difficult opener”. 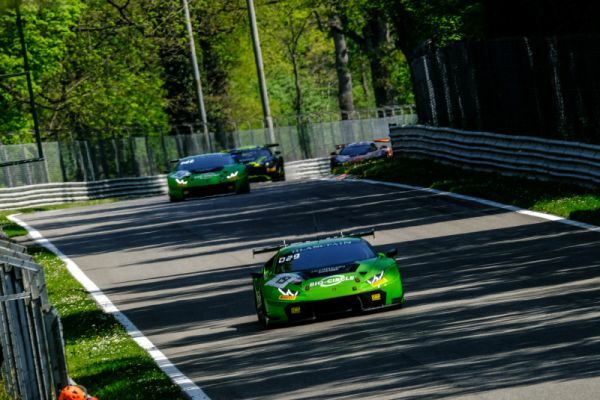 Raffaele Giammaria will be back behind the wheel of the Lamborghini Huracán GT3 run by Grasser Racing Team for the second round of the season in Silverstone next May 18-20. 3 questions for Beitske Visser and Nico Menzel. GT4 European Series: Strong BMW line-up at season-opener in Zolder. Blancpain GT Series: opening weekend for the Sprint Cup at Zolder. Jamie Vandenbalck, premier leader de la GT4 Belgium Cup!